Buy Funny Things - The Daily Dose Cartoon Book - Available Now. "Top 10 Chinese hack Gmail jokes"
10) Sarah Palin actually hacked into Gmail accounts, because it was easier than hunting from the back of a motorcycle. 9) Chinese hackers got into Gmail accounts, but Charlie Sheen thinks he did it. 8) The FBI says that they can not fully quantify the scale of damage caused by the Chinese attacks on Gmail, but they love to eat Chinese. 7) The same hackers who attacked Gmail were going to attack Arnold Schwarzenegger and Tiger Woods accounts, but they did not have enough space to download all the pictures of their secret girlfriends. 6) Twitter hacked into Gmail, to make sure they weren't missing anyone that writes less than 140 characters per email. 5) Barack Obama denies that China hacked his Gmail account, but said that anyway all his personal accounts belong to Beijing banks. 4) Nobody, including China, can hack your Gmail account, if you don't have one. 3) Libyan dictator Muamar Gaddafi hacked Gmail accounts of American government officials, and then got bombed by NATO. 2) If Chinese hackers can hack into Gmail accounts, surely anonymous hackers can crack into Weiner's twitter. 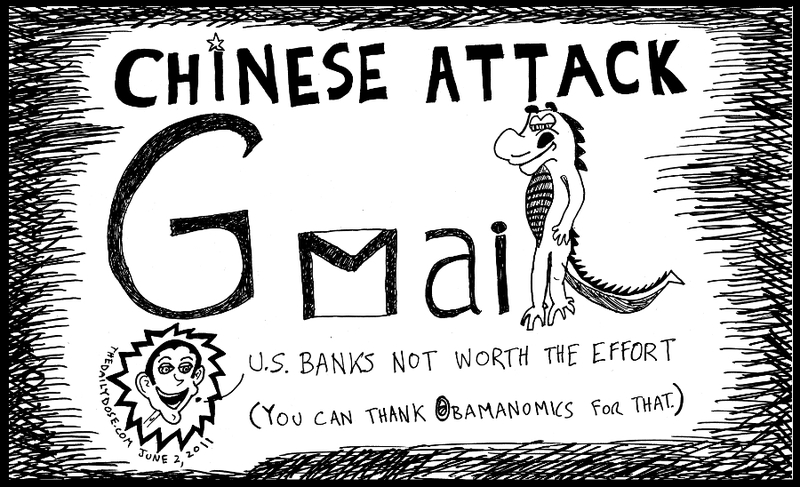 1) China claims it has not attacked Gmail accounts, though they might if the U.S. debt ceiling isn't raised. Click Here for the AntiNuke WMD Survival Guide - incl. Life Saving Nutritional Info.